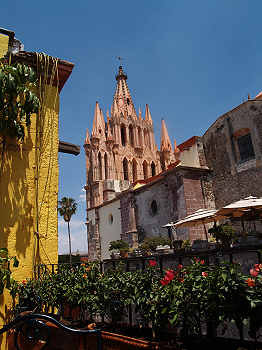 T here are a few Restaurants in San Miguel with killer views of the Parroquia, the town's beloved and much photographed church. Two of these San Miguel restaurants are on Cuna de Allende. One of them also has killer prices. But cross the street and walk up the narrow stairway to La Posadita, settle down at one of the rooftop tables and you can enjoy that same killer view (actually, it's better) for not much more than chump change. And oh, yeah, the food's great too. As you sip, munch on the ever-present basket of crisp tortilla chips served with two salsas. The green is tangy, with lots of tomatillo flavor and very little bite. The red has more of a kick but is not take-the-top-of-your-head-off spicy. The mostly traditional Mexican menu is well-executed and always really fresh. The thick and chunky guacamole is made to order. Most of the produce used is locally sourced from organic ranchos near San Miguel. Nice starters include the jicama pico de gallo, sopecitos, which are like miniature thick tortillas with beans, chesse, sour cream, lettuce and tomato piled on top, or the Mole de Olla, a rich red beef broth with chunks of beef, corn, green beans, potatoes and zucchini. On weekends, they serve pozole, that wonderful Mexican stew that consists of a red or green broth with chunks of pork or chicken and lots of hominy. This is accompanied by a platter of condiments you add to taste. La Posadita offers all the traditional additions—shredded lettuce, radish chunks, chopped onion, fresh cilantro, limes for squeezing, oregano, and chile flakes. Also, there's a basket of crisp tostadas for breaking up into chunks and dropping into the broth. Oh, so yummy. Several restaurants in San Miguel serve it, but I have to say this was the best pozole I've had in Mexico outside of a private home. On my last visit I decided to try the cochinita pibil, a delicious mixture of shredded pork in a sauce made with Seville orange juice, achiote, cumin, garlic and other spices, and baked in a banana leaf. Here, it's served with a basket of fresh, warm tortillas. This dish, along with pozole, is something of a San Miguel restaurant litmus test for me. If they get these right, they probably get it all right. La Posadita passed on both counts. Prices are very reasonable, especially for food of this quality and quantity. Except for one or two top-of-the-menu items like arrachera, dinner will cost you less than ten bucks per person, not counting drinks. Some dishes are less than five. Insiders' Tip: Main dish portions are large. 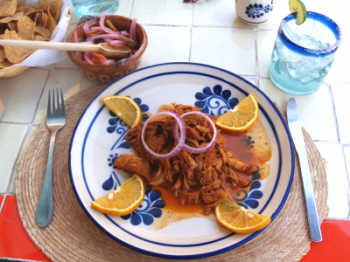 The cochinita pibil, for example, is easily enough to make six tacos. Two people can share one main dish plus a soup or salad for a substantial and economical meal. All in all, I'd have to say that of all the restaurants in San Miguel, La Posadita is one of the best bargains going—and the view is free.